Sexual abuse can happen to anyone and can take many different forms. 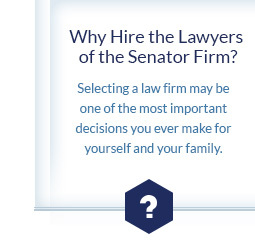 With more than 100 years of combined legal and legislative experience, our team has knowledge and skills to represent individuals and families in a variety of cases, many of which are described below. Children are among the most physically and emotionally vulnerable members of our society. When adults take advantage of that vulnerability in order to engage in inappropriate touching or other physical assault for the purposes of sexual gratification, the damage it causes can be profound and long-lasting. Childhood sexual abuse is particularly deplorable when it comes at the hands of the very individuals we teach our children to trust the most, including teachers, members of the clergy, Boy Scout leaders, and coaches, among others. The Senators Firm is committed to advocating on behalf of children and parents for safe schools, churches, and other child-oriented organizations. 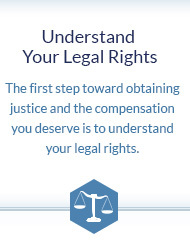 When kids are abused, and when employers, supervisors, and others who are responsible for investigating, reporting, and stopping suspected abuse fail to do so, justice demands that the survivors be compensated to the fullest extent possible. The California sexual abuse lawyers at The Senators Firm are experienced in obtaining compensation from individuals, organizations, and governmental agencies that acted abusively and/or failed in their responsibilities to protect the children under their care. The firm's ongoing litigation and investigations include cases against the Catholic Church and other clergy, the Boy Scouts, and the Los Angeles Unified School District, among others. Hazing and bullying of children have existed for many years. 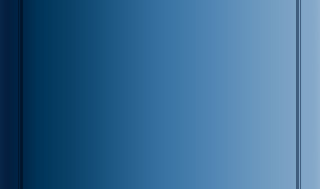 More recently, however, there has been a recognition on the part of mental health care professionals that hazing and severe bullying, including sexualized hazing and bullying and "cyber stalking" through the Internet and other electronic media, is both widely underreported and extraordinarily damaging to young people. In addition, there have been an increasing number of reports of physical and emotional bullying of students by teachers and other school staff. Bullying is not merely physically painful and emotionally damaging; it has even been linked to acts of desperation, including suicide among particularly susceptible children. Most troubling is the fact that school administrators often ignore or respond ineffectively to reports of bullying and hazing, and parents feel powerless to stop it. These behaviors, especially when associated with sexual abuse, should never be tolerated and victims and their families should understand that they have the right to speak out. The Senators Firm has been at the forefront of efforts to stop bullying, as well sexual hazing and cyberstalking, and to obtain compensation for victims to help them regain their self-esteem and emotional wellbeing. Sexual abuse of adults continues to be rampant in the workplace as well as a variety of other institutional settings, including churches, colleges, the military, board and care facilities that cater to the elderly as well as the physically / mentally challenged, and even in the offices of doctors, therapists, and other health care professionals. Sexual abuse and harassment of adults can have profound physical and emotional impacts, especially when victims are vulnerable or powerless to stop it. California and many other states have laws designed to protect and compensate adult victims of sexual abuse and harassment. 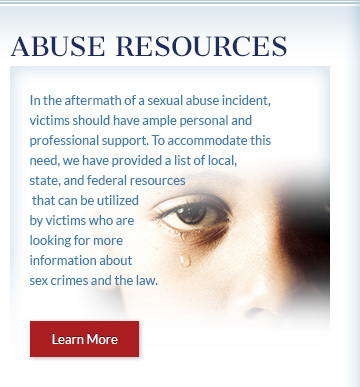 The knowledgeable California sexual abuse attorneys of The Senators Firm can advise you of your rights and guide you to the resources you need. Every sexual abuse case is unique and highly personal. This is why our firm never prescribes a one-size-fits-all solution to cases and always makes it a priority to provide clients and their loved ones with the personal attention they deserve. Our successful case history and numerous awards and peer recognitions speak volumes about our legal abilities; however, our genuine desire to help sexual abuse victims through these difficult legal proceedings is something you have to see for yourself. 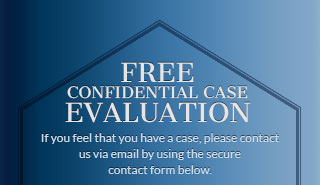 Schedule a free and completely confidential case evaluation to meet with a California sexual abuse lawyer from our firm, or contact The Senators Firm today.